Power plants are the nation’s largest source of the carbon dioxide emissions that contribute to climate change. Implementing power plant upgrades, as favored by some groups, would result in slightly lower air quality and modest adverse health effects, a recent study found. Pictured is a coal-fired power plant in Nevada. States will gain large, widespread, and nearly immediate health benefits if the Environmental Protection Agency sets strong standards in the final Clean Power Plan, according to the first independent, peer-reviewed paper of its kind, published today in the journal Nature Climate Change. The researchers analyzed three options for power plant carbon standards: upgrading plants, shutting them down, and changing how energy is delivered and used. The last has the greatest health benefits, and is projected to prevent an expected 3,500 premature deaths in the United States every year, with a range of 780 to up to 6,100, and ward off more than 1,000 heart attacks and hospitalizations a year from air pollution-related illness. The other options provide fewer estimated health benefits and could even have detrimental health effects, according to the paper. The study comes at a pivotal time for climate policy, as the EPA prepares to release the final Clean Power Plan this summer. The plan is the nation’s first attempt to establish standards for carbon dioxide emissions from power plants. It is also viewed as an important signal of U.S. leadership in the run-up to international climate negotiations in Paris in December. “If EPA sets strong carbon standards, we can expect large public health benefits from cleaner air almost immediately after the standards are implemented,” said Jonathan Buonocore, a research fellow at the Center for Health and the Global Environment at the Harvard T.H. Chan School of Public Health and a co-author of the new paper. The researchers mapped the air quality and related health benefits for the entire continental United States under the three options for the Clean Power Plan. They found that all states and types of communities would see improved air quality under strongest option. Pennsylvania, Ohio, and Texas would post the greatest health gains, with an estimated 230 to 330 premature deaths prevented each year. “An important implication of this study is that the largest health benefits from the transition to cleaner energy are expected in states that currently have the greatest dependence on coal-fired electricity,” said Dallas Burtraw, Darius Gaskins Senior Fellow at the nonprofit organization Resources for the Future, another co-author of the paper. Power plants are the nation’s largest source of the carbon dioxide emissions that contribute to climate change. They also release other pollutants, such as sulfur dioxide, nitrogen oxides, and particulate matter — precursors to smog and soot that harm human health. The study looked at the added health benefits, or co-benefits, of carbon standards from reductions in these other pollutants. The results of the analysis in the study are surprising. Upgrading power plants, as favored by some groups, results in slightly lower air quality and modest adverse health effects. Shutting down the plants entirely, while making the deepest cuts in carbon emissions, does not produce the biggest health benefits because it does not result in end-user energy efficiency. Changing the way energy is delivered and used prevents almost twice as many premature deaths as the next-best option for every ton of carbon dioxide reduced, the study found. The results panned out like the story of the “three little pigs.” One option is like the house of straw — it seems protective but it isn’t. Another is like the house of sticks — it is stronger than straw but ultimately doesn’t hold up. The final option is like the house of bricks — it uses all the right building blocks and has the best outcome. The findings demonstrate that the EPA’s policy choices will determine the clean air and public health benefits for states and communities. The option in the study with the greatest health benefits is the one that is most similar to the draft standards released by the EPA last June. So, the good news is that the formula in the draft Clean Power Plan is on the right track. The new paper also has important international implications and brings much-needed attention to the benefits of climate change solutions. 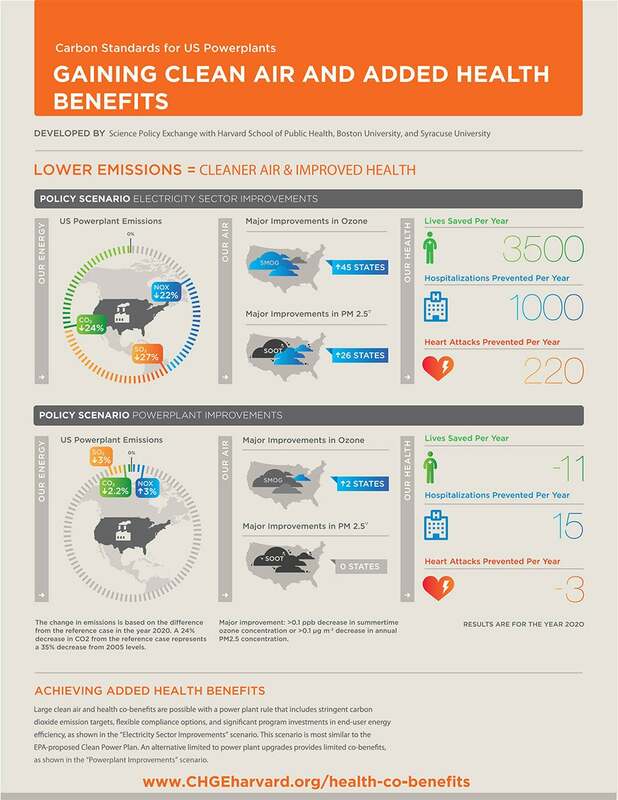 “The immediate and widespread local health benefits of cleaner air from policies to address greenhouse-gas emissions can provide a strong motivation for U.S. and global action on climate change,” Driscoll concluded. A follow-on study analyzing the added benefits of power plant carbon standards for water, visibility crops, and trees is expected out this summer.